In June last year (2016) Nick and I, accompanied by our blogging daughter Louise (afairymind) at thestorytellersabode, headed down to Cornwall for a week. Cornwall is very beautiful, with stunning scenery both along the coast and inland (as fellow blogger draliman, who lives there will affirm. I’ve linked to a post here in which Ali shares a few photos of his beloved Cornwall. We had the great pleasure of meeting up with him during the week). Culturally, Cornwall is closer to our Celtic neighbours in Wales than to other English counties, as the many place-names suggest. I wrote a brief, introductory post about Cornwall while we were still down there last June but, as often happens with me, I didn’t get round to doing the rest once we got home. We visited many great sites and I intend to write up several over the next few weeks. We rented a cottage for the week in the little fishing village of Newlyn on the south coast of the Penwith peninsula in the far south-west of Cornwall. 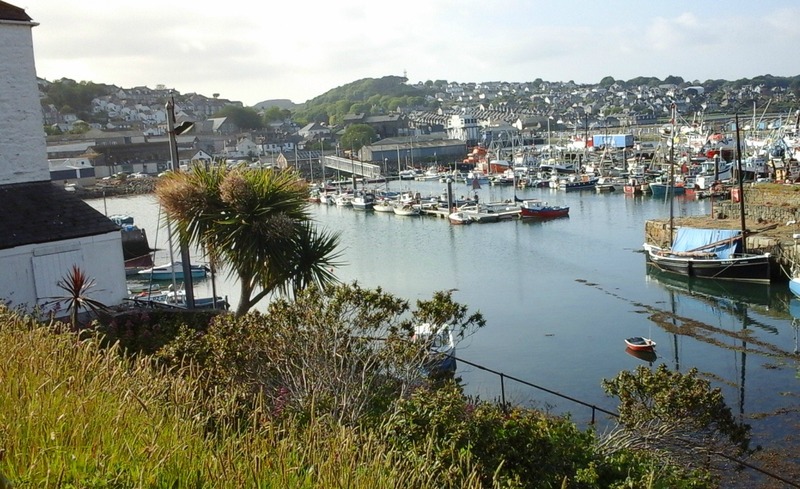 Newlyn is only a few minutes drive from the bigger fishing town of Penzance (yes, Cornwall is renowned for its fishing industry and Penzance for that wonderful opera!). The photo below is of Newlyn harbour. The first site we visited the day after our arrival wasn’t a long drive from Newlyn, as it was also located in the Penwith peninsula. The site was Carn Euny (approximate location marked with the red x on the map of Cornwall below). 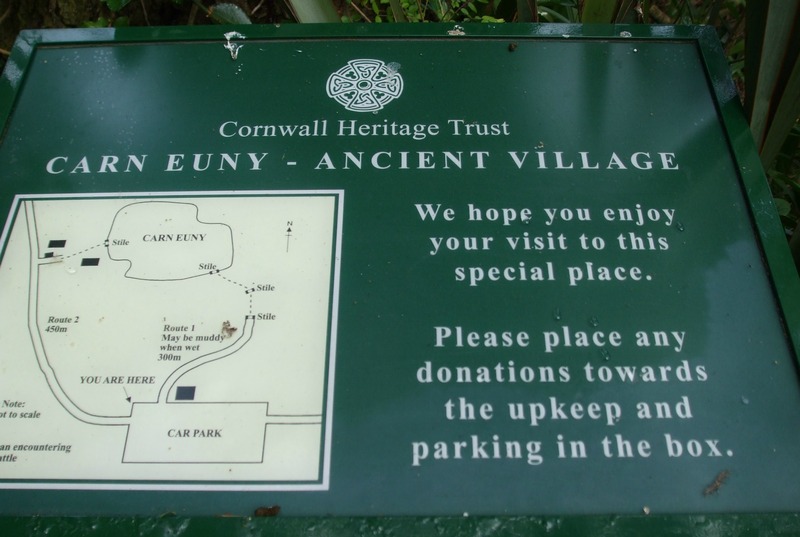 Carn Euny is an Iron-Age-Romano-British village, established in 400 BC and occupied until the 4th century AD. Formerly known as Chapel Euny, this ancient village is located in the Penwith peninsula, in granite uplands rich in antiquities. Arriving at Carn Euny village, we had a look at a couple of information boards and site plans. 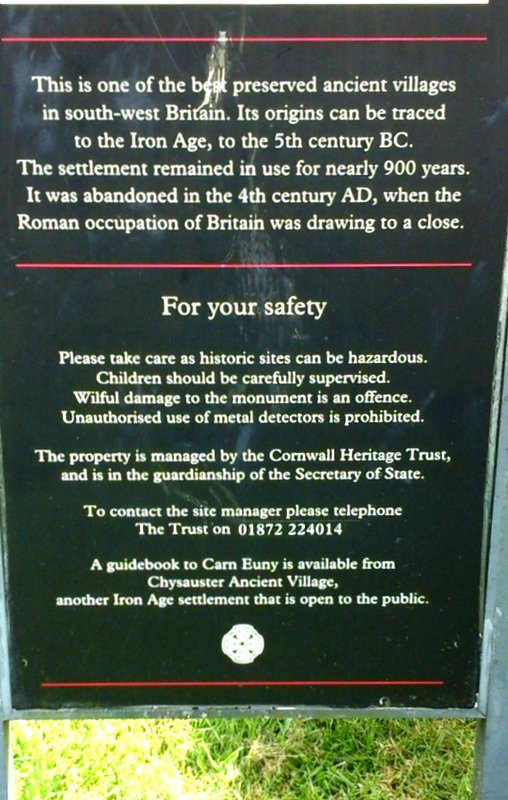 This one mentions another ancient site which we also visited during that week (Chysauster). The following is a plan of the different houses at Carn Euny, as well as the fogou and ruins of a cottage dated approximately 1750. In the middle of these stone houses is a fascinating Iron-Age structure known as a fogou – a feature found only in the far west of Cornwall. The name comes from a late Cornish word meaning cave – an underground, or partly underground, structure. 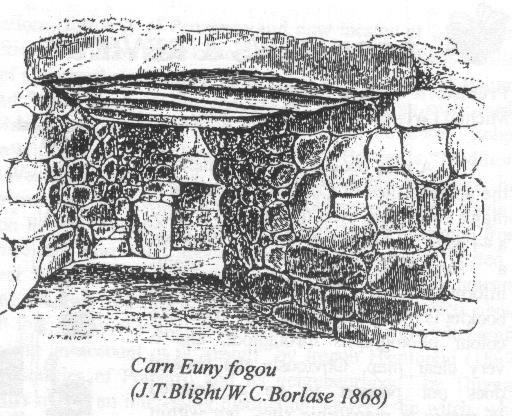 The fogou at Carn Euny is, according to the guide book, “unique in having a round chamber as well as the long passage characteristic of most fogous”. Fogous basically consist of a main passage, often aligned east-west or north-east to south-west. The passage is built of dry stone walls, which can be seen in the photos, and roofed with giant capstones – in evidence at the entrances and sketched into the diagram above. Subsidiary chambers and small narrow side passages are also features. Theories for the purpose of fogous range from hideouts in time of trouble to cellars for storing goods and livestock. At Carn Euny, there is evidence that the fogou could have been for religious purposes – “the parish church of ancient times” (according to the guide book again). There is also evidence that the round chamber here could have been a cult centre before the long passage was built. As for dating, most fogous seem to have been built in the later Iron Age (i.e. 400 BC – AD 43). Nothing seems to have been known about the fogou or settlement at Carn Euny before the first half of the 19th century when it was discovered by miners excavating for tin. Cornish antiquary, William Copeland Borlase excavated the fogou between 1863 and 68, but it wasn’t until the 1920s that any of the houses were examined. As with many ancient sites, including Hadrian’s Wall and the monasteries and abbeys ordered to be pulled down in the dissolution of the monasteries of 1536-39, Carn Euny suffered extensive damage over the years from stone robbing for local buildings, field walls, stock shelters, gate posts and so on. The cultivation of fields for potatoes and daffodils – for which Cornwall is famous – caused further damage to the site, as did miners prospecting for tin. All in all the original form of the houses isn’t at all clear. 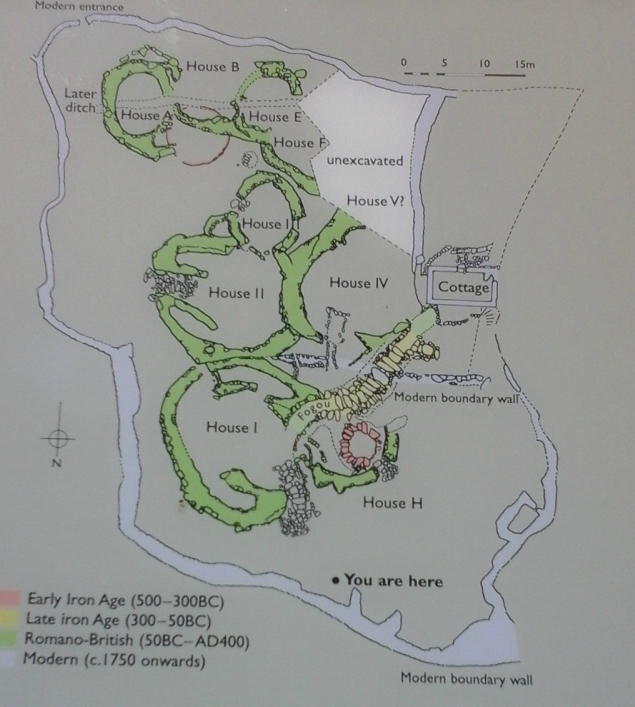 Nevertheless, ten houses from the Romano-British period have been excavated (house numbers on the plan relate to the order of excavation). 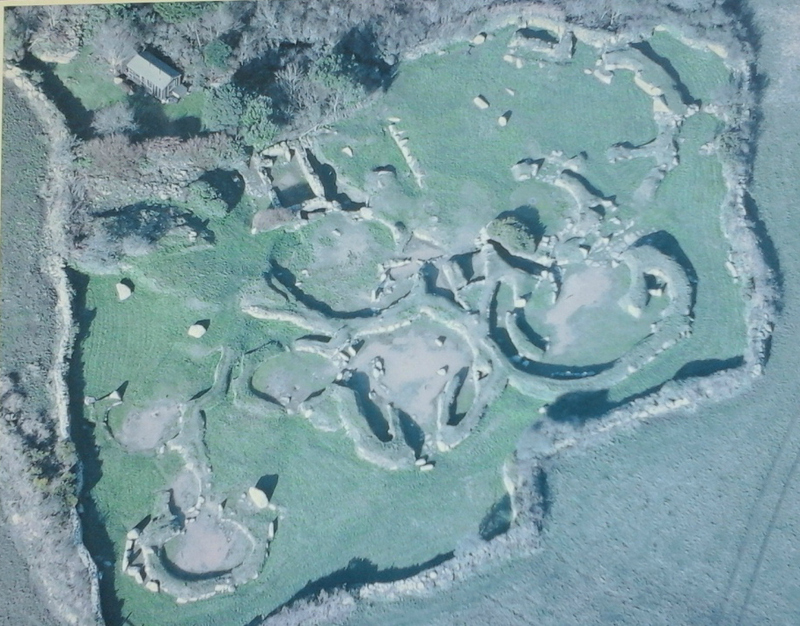 Houses seem to be interlocking, courtyard-style structures, arranged haphazardly across the site (unlike at Chysauster, a later village, where houses are along a central street). Courtyard-style houses are usually oval, enclosed by a thick outer wall with a paved entrance facing away from the prevailing SW winds. The entrance leads into the courtyard, around which several rooms are built into the thickness of the outer wall. A large oval or circular room opposite the entrance is thought to have been the main living room, with the other rooms serving as stables and storage areas. Thatch roofing is thought to have covered the rooms, leaving the courtyard open to the elements. Stone capped drains for bringing water in and out of the houses are also a feature. 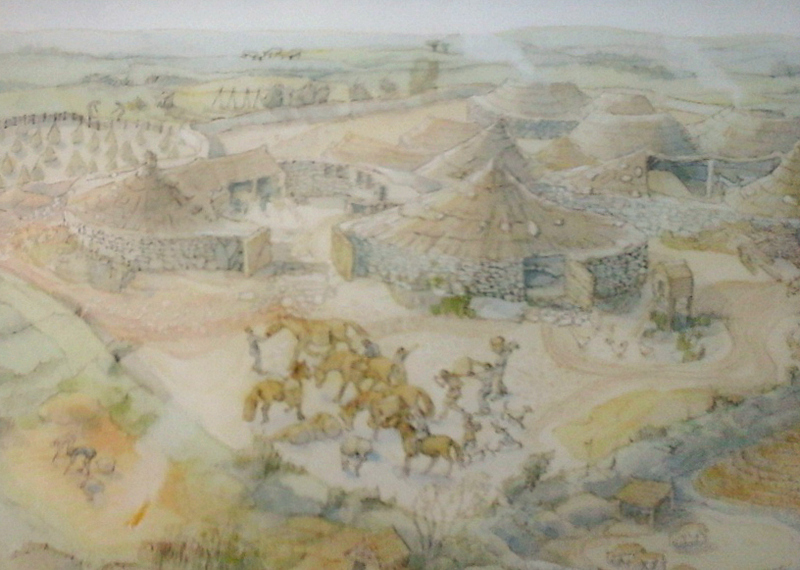 This is an impression of what the village may have looked like in the 4th century AD from a notice board at the site. Unfortunately it’s very faint, so not very clear. Carn Euny is a wonderful site to visit, especially on a sunny day. There are no facilities or information centre there, so it was a quiet experiences for us on a school day in June. There are plenty of information boards for visitors to understand the layout of the village and make their own way round. We bought a guide book later in the week when we went to Chysauster, where there’s a small information centre. I suppose the best idea would be to go to Chysauster first… But we didn’t know that at the time. Thanks, Arv. Yes, Louise is our daughter, and we share a love of history and travelling to great places. She has some wonderful photos of Cornwall, and has shared a few on her posts. It is lovely down there, Ali – and it’s only ‘down the road’ from you! 🙂 There are a lot of ancient sites, like Carn Euny, which suited Lou perfectly. Thank you for reading! Great photos. I feel like I’ve been there with you. That’s a great compliment, Peggy, especially coming from you! Thank you. Beautiful post Millie 🙂 and lovely pics. Cornwall is a beautiful place that keeps many stories to be told! Cornwall has many stories to tell, Ann. Many of them are about pirates, who stored their ‘booty’ in the many caves along the Cornish coast. Many novels and TV series are set there, including ‘Poldark’ and ‘Rebecca’. Thank you for reading! Fascinating place, and you do such a wonderful job explaining it! I envy you living in Britain. 😛 And I look forward to more of your Cornwall posts…. 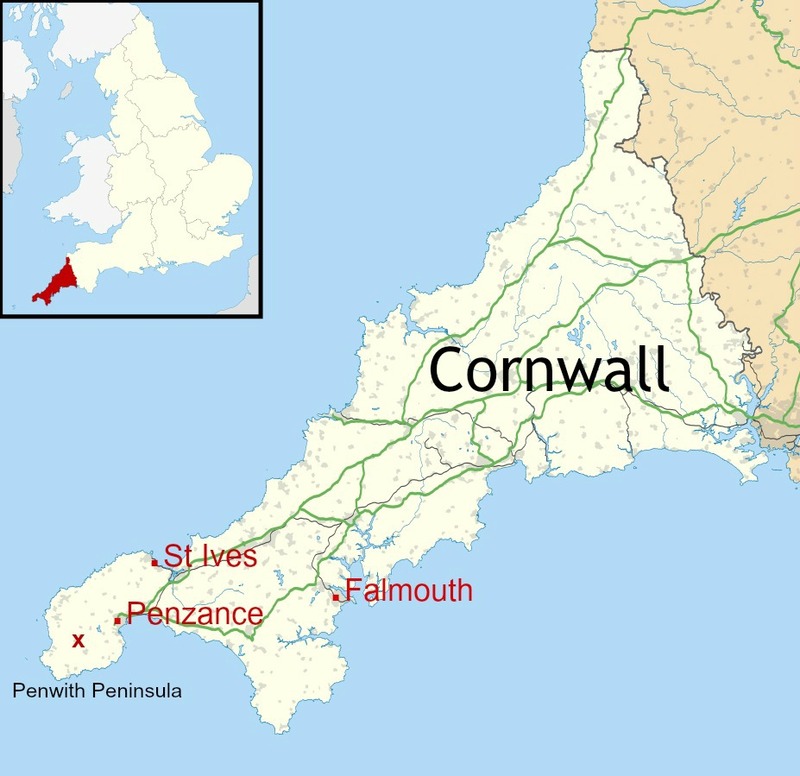 Cornwall is somewhere I know next to nothing about, yet I believe one of my great grandmother’s family hailed from there! Thanks for illuminating me! Cornwall has much to offer. There are many wonderful historic sites, several of them really ancient ones. There are also links with the legendary King Authur and his castle at Tintagel (which we visited). There are also the connections with the Poldark stories and tin mining. I still have a lot of posts to do and hope to work through them gradually. If your great grandmother’s family came from Cornwall, Amanda, you’re likely to have Celtic roots as well as Norse ones! Cornwall is very Celtic, like Wales and Ireland. Perhaps I do but it appears to be only half as much as my Scandinavian ancestry if the DNA ethnicity estimates are anything to go by. You must have Viking roots from those Norse invaders in your gene pool, Millie??? I’ve never had my DNA tested, Amanda. I know I have a huge chunk of Celtic in there. With one Irish grandad and the other Welsh, that gives me a big nudge in that direction. The rest is likely to be Anglo-Saxon, with possibly some Norse in there, too. Some ‘English’ DNA has exhibited all kinds of exotic origins, thanks to the Roman legions that were here for 500 years! Roman auxiliaries came from far and wide – Syrian archers, for example. So nothing would surprise me. I imagine you know the mix in yours? There were a few lovely surprises. Iberian presumably from Roman legions and Viking slaves and Eskimo/Inuit!!! It does rather! But a really pleasant one and I think it is very small and far back perhaps? I’m blaming those dastardly Vikings! Heehee. Perhaps a Greenland inuit? I was always fascinated with Greenland and used to sketch Greenlandic scenes from books as a child!!! Haha! Well, that’s a possibility. I hadn’t considered Greenland when I was thinking of Inuit. I’ve never wanted to go to Greenland – it always looks so bleak and sparsely populated on pictures I’ve seen, not to mention cold! It’s funny the things children become interested in. I wonder what triggered your fascination with Greenland? I really don’t know why I was interested in Greenland. There was very little information around in those days bar a few library books so perhaps i didn’t have too much choice. But I did love those scenes of glaciers, ice and blue black water. It fascinated me. I imagine your fascination was partly because Greenland was so completely different to Australia. It would have been a place of mystery to you, so you needed to find out! I think that might have been it. It was so exotic. Strange though. I could have picked anywhere in the world, but I picked it! What an interesting place to visit – thanks for taking us along! I’m having a hard time reconciling the ruins with painting. Is the idea that the stone walls used to be higher and the stones above ground were stolen, or that the stone walls weren’t that tall to begin with, and you couldn’t stand up except maybe in the center of the building, under the highest part of the roof? The picture is just an artist’s impression of what the village could have looked like before all the stones were pilfered. As with so many buildings from the past, people over the centuries have taken the ready-quarried and cut stone for their own houses, walls etc. It would save them a lot of time and energy, after all. The buildings at Carn Euny would have had much higher walls than can be seen today. They probably had thatched roofs though, which I imagine were lower around the sides. People may well have had to stoop. The site is interesting because of its age. Anything that pre-dates Roman times is pretty amazing. This is fantastic! Thanks for the post! I am planning a trip to cornwall next year!